Author(s): Wen-Juan Ni, Xiao-Min Leng. Department of Neurology, The First Affiliated Hospital of Xinxiang Medical University, Henan 453100, People's Republic of China. MicroRNAs (miRNAs) are small and important RNA molecules. They can regulate gene expression at different levels. Although their biogenesis has been well documented, elucidation of miRNA-dependent activation of mRNA translation has just begun. Here, we highlighted different patterns of miRNA-dependent activation of mRNA translation: miRNA can activate mRNA translation through binding different target sites; in different sub-cellular locations; under different cellular circumstances. MiRNA-dependent activation of mRNA translation suggests unexpected functions of miRNA, that could provide new clues in functional studies of other ncRNAs. Keywords: Cellular circumstance, gene expression, miRNA, sub-cellular location, target site, translational activation. Affiliation:Department of Neurology, The First Affiliated Hospital of Xinxiang Medical University, Henan 453100, People's Republic of China. Keywords:Cellular circumstance, gene expression, miRNA, sub-cellular location, target site, translational activation. Abstract:MicroRNAs (miRNAs) are small and important RNA molecules. They can regulate gene expression at different levels. Although their biogenesis has been well documented, elucidation of miRNA-dependent activation of mRNA translation has just begun. 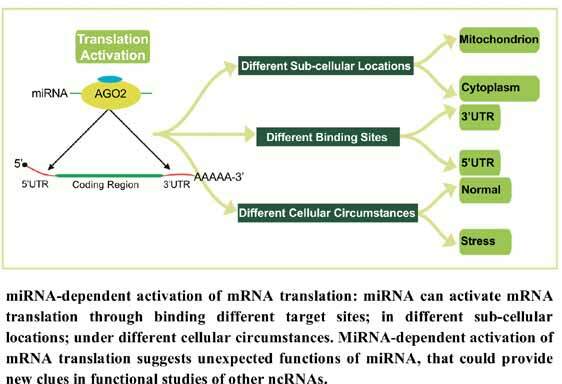 Here, we highlighted different patterns of miRNA-dependent activation of mRNA translation: miRNA can activate mRNA translation through binding different target sites; in different sub-cellular locations; under different cellular circumstances. MiRNA-dependent activation of mRNA translation suggests unexpected functions of miRNA, that could provide new clues in functional studies of other ncRNAs.